You have no idea how many couples travel to Niagara Falls for romantic getaways—in my circle of friends, we have a joke that if you haven’t taken your partner to Niagara Falls at least once, then you’re not serious yet. The tradition has been going on since back during the days of Napoleon, when his brother traveled to the Falls to honeymoon there. He loved it so much that it became a popular spot for the upper-class French to visit on romantic occasions, and that reputation never really disappeared. The Falls host over 50,000 honeymooning couples annually, and you can even get honeymoon certificates signed by the mayor to commemorate the occasion. Whether you’re honeymooning or not, Niagara Falls is very romantic, and since fall is coming, I’m going to suggest some romantic options for you and your love to do this fall at the Falls. 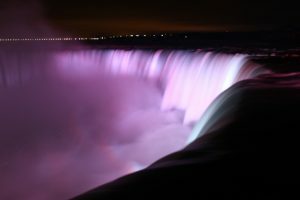 The most romantic thing you could do would be to walk along the Falls at night, looking out at the lights on the water. The Falls light up with colour throughout the year, but especially in the colder months, and it’s gorgeous. In the fall, the walkways aren’t as busy as during the summer, so you and your sweetheart can have time to cuddle up while gazing out at the water, and you won’t have to worry about being in anyone’s way or about crowds at all. At Clifton Hill, you can find the Skywheel, a giant Ferris wheel that lets you have views of both the American Falls and the Horseshoe falls. The little carriages are reminiscent of the carriages on the London Eye over in the UK, and the trip round the wheel takes a while to complete the circuit, but it’s a lovely why to cuddle up and admire the views. These aren’t very fall-specific, mostly because it Niagara is on all year, but I have found that these two things are most romantic in the fall, when people bundle up and fewer people are out and about. I don’t like being outside in the winter if I don’t have to be, and I hate the crowds that the summer brings, so fall is my favourite time to look out at the falls and hop on the Skywheel with my partner. I hope you enjoy these activities!